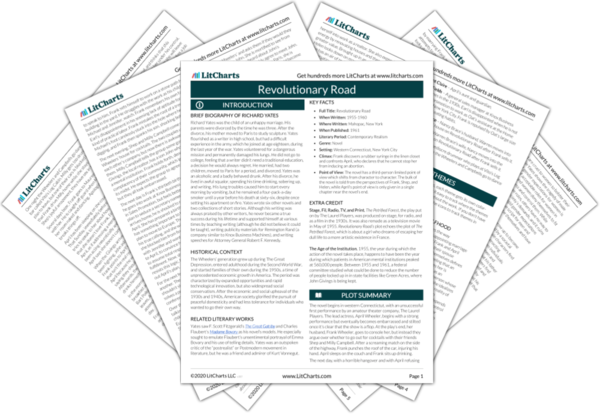 Welcome to the LitCharts study guide on Richard Yates's Revolutionary Road. Created by the original team behind SparkNotes, LitCharts are the world's best literature guides. A concise biography of Richard Yates plus historical and literary context for Revolutionary Road. A quick-reference summary: Revolutionary Road on a single page. In-depth summary and analysis of every chapter of Revolutionary Road. Visual theme-tracking, too. Explanations, analysis, and visualizations of Revolutionary Road's themes. Revolutionary Road's important quotes, sortable by theme, character, or chapter. 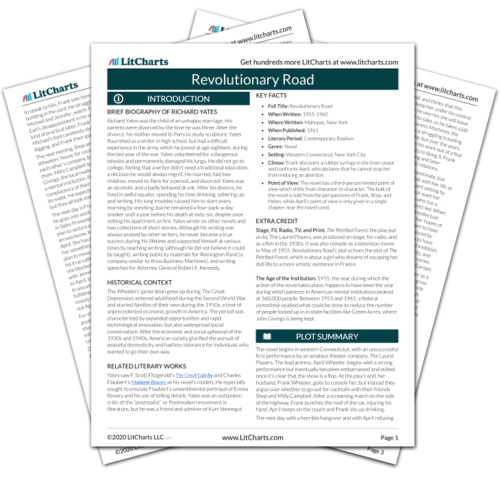 Description, analysis, and timelines for Revolutionary Road's characters. Explanations of Revolutionary Road's symbols, and tracking of where they appear. An interactive data visualization of Revolutionary Road's plot and themes. Richard Yates was the child of an unhappy marriage. His parents were divorced by the time he was three. After the divorce, his mother moved to Paris to study sculpture. Yates flourished as a writer in high school, but had a difficult experience in the army, which he joined at age eighteen, during the last year of the war. Yates volunteered for a dangerous mission and permanently damaged his lungs. He did not go to college, feeling that a writer didn’t need a traditional education, a decision he would always regret. He married, had two children, moved to Paris for a period, and divorced. Yates was an alcoholic and a badly behaved drunk. After his divorce, he lived in awful squalor, spending his time drinking, sobering up, and writing. His lung troubles caused him to start every morning by vomiting, but he remained a four-pack-a-day smoker until a year before his death at sixty-six, despite once setting his apartment on fire. Yates wrote six other novels and two collections of short stories. Although his writing was always praised by other writers, he never became a true success during his lifetime and supported himself at various times by teaching writing (although he did not believe it could be taught), writing publicity materials for Remington Rand (a company similar to Knox Business Machines), and writing speeches for Attorney General Robert F. Kennedy. The Wheelers’ generation grew up during The Great Depression, entered adulthood during the Second World War, and started families of their own during the 1950s, a time of unprecedented economic growth in America. The period was characterized by expanded opportunities and rapid technological innovation, but also widespread social conservatism. After the economic and social upheaval of the 1930s and 1940s, American society glorified the pursuit of peaceful domesticity and had less tolerance for individuals who wanted to go their own way. Yates saw F. Scott Fitzgerald’s The Great Gatsby and Charles Flaubert’s Madame Bovary as his novel’s models. He especially sought to emulate Flaubert’s unsentimental portrayal of Emma Bovary and his use of telling details. Yates was an outspoken critic of the “postrealist” or Postmodern movement in literature, but he was a friend and admirer of Kurt Vonnegut. Climax: Frank discovers a rubber syringe in the linen closet and confronts April, who declares that he cannot stop her from inducing an abortion. Point of View: The novel has a third-person limited point of view which shifts from character to character. The bulk of the novel is told from the perspectives of Frank, Shep, and Helen, while April’s point of view is only given in a single chapter near the novel’s end. Stage, Fil, Radio, TV, and Print. The Petrified Forest, the play put on by The Laurel Players, was produced on stage, for radio, and as a film in the 1930s. It was also remade as a television movie in May of 1955. Revolutionary Road’s plot echoes the plot of The Petrified Forest, which is about a girl who dreams of escaping her dull life to a more artistic existence in France. The Age of the Institution. 1955, the year during which the action of the novel takes place, happens to have been the year during which patients in American mental institutions peaked at 560,000 people. Between 1955 and 1961, a federal committee studied what could be done to reduce the number of people locked up in in state facilities like Green Acres, where John Givings is being kept. Levine, Yael. "Revolutionary Road." LitCharts. LitCharts LLC, 7 Nov 2017. Web. 20 Apr 2019. Levine, Yael. "Revolutionary Road." LitCharts LLC, November 7, 2017. Retrieved April 20, 2019. https://www.litcharts.com/lit/revolutionary-road.